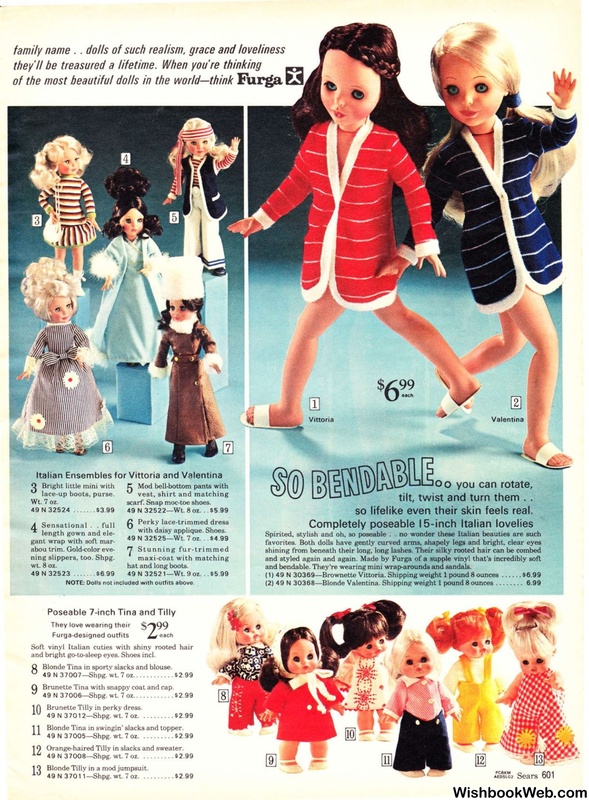 NOTE: Dolls not included with outfits above. and bright go-to-sleep eyes. Shoes incl. Blonde Tina in sporty slacks and blouse. Brunette Tina with snappy coat and cap. Brunette Tilly in perky dress. Blonde Tina in swingin' slacks and topper. Orange-haired Tilly in slacks and sweater. 49 N 37008-Shpg. wt. 7 oz. Blonde Tilly in a mod jumpsuit. so lifelike even their skin feels real. and bendable. They're wearing mini wrap-arounds and sandals.